I love when my two worlds meet somewhere in the middle! 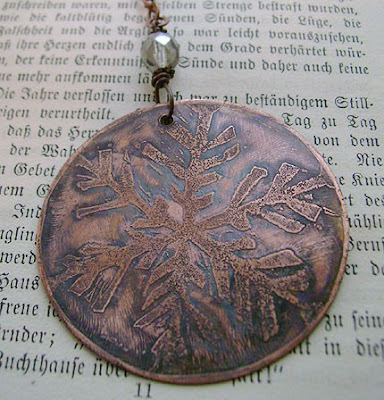 This is an ornament that I created last week using a snowflake rubber stamp that I carved. The metal is stamped and the ink acts as a resist, it's then set in an acid bath until the metal is 'eaten' away. After it's washed, the image is antiqued with a blackening solution. Then, ta-da! It's an etched metal ornament. I'm not a fan of chemicals, but it's an easy enough process and I love the results. Now to make those snowflake rubber stamps do double duty and create some gift cards! Oh how I love printmaking! You can find these ornaments and all sorts of beady goodness in my Etsy shop.